It’s no secret that the world is shedding the once mighty car. The four-wheel sedan and coupe are becoming things of the past; relics, dinosaurs, a kid’s old lunchbox, clothes shoved in the donation box in the Wal-Mart parking lot. Increasingly the roads are being taken over by SUVs and crossovers. Higher up, roomier (for the most part) and able to carry more than the sedans and coupes, they are quickly becoming the norm. There is a problem with most however; they just aren’t all that fun to drive. Sure, the AMGs, F-Pace’s and Cayennes can be spirited, but even they can’t be whipped around like a small sports car or even a midsize sedan. Sadly, there may come a day when we may not be able to find a car to whip around anywhere. For those of us who still worship the car, we will have to someday concede and give up our cars in favor of an SUV. 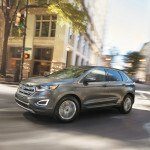 When we do the Ford Edge would be a nice consolation prize. I’ve tested all manner of SUVs and crossovers through the years; after all…well you know. Those SUVs and crossovers have been big and small, short and fat; luxurious and plain, slow and fast. 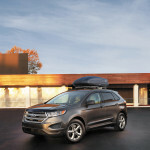 Until Ford sent me its Edge for a recent week. A few months ago I had a week with the smaller cousin to the Edge, the Escape. It was nice, just a bit too confined. The Edge was not. In fact, it was just the right size. 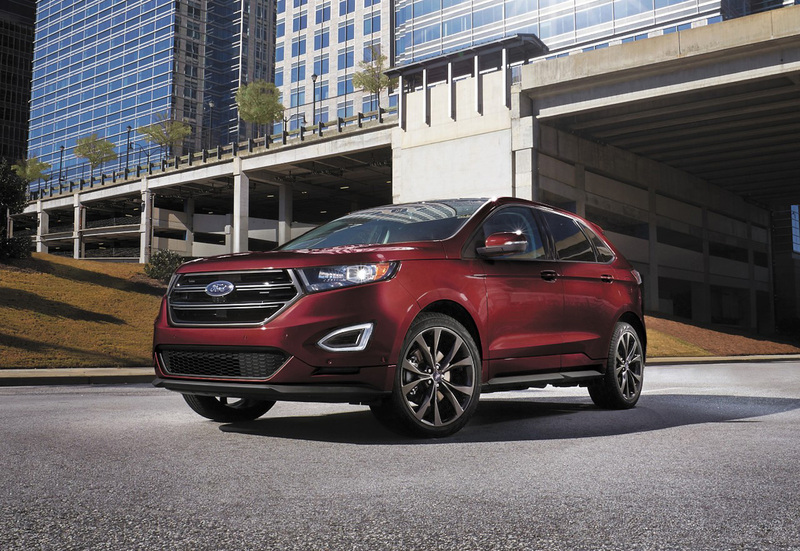 The 2017 Ford Edge is a five-passenger midsize crossover that can be had in four trim levels: SE, SEL, Titanium and Sport. 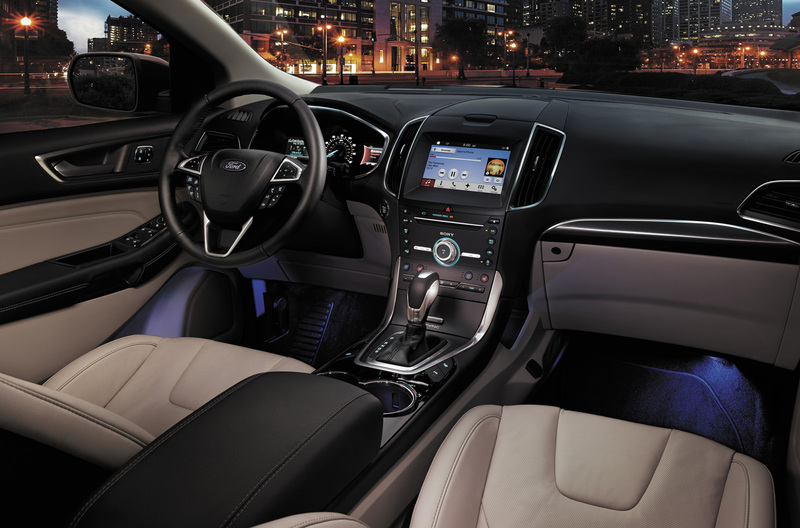 The SE is pretty loaded with things like an acoustic windshield, active grille shutters, cruise, rearview camera, Ford’s Sync system and a 4.2-inch central display. 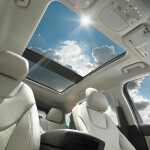 The SEL adds heated mirrors on the outside, auto-dimming rearview mirror, dual-zone automatic climate control, upgraded cloth upholstery, an eight-way power-adjustable driver seat (with power lumbar adjustment), a six-way power-adjustable passenger seat, a leather-wrapped steering wheel and satellite radio. You can also add leather upholstery, heated front seats, a nine-speaker audio system and the Sync 3 infotainment system with an 8-inch touchscreen to the SEL. The Titanium, which is what I had for the week, moves the wheels up to 19-inch, adds a nice hands free liftgate, noise reduction, gives some upgrades to the interior trim, and other niceties such as driver-seat memory settings and a 12-speaker Sony audio system with an HD radio. The Sport level adds a turbocharged 2.7-liter V6 engine, 20-inch wheels, a sport tuned suspension and sport styling trim. My Titanium tester had Equipment Group 301A which included the Technology package. 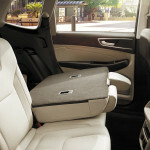 With it I had ventilated front seats, heated rear seats and a panoramic sunroof. I also had Equipment Group 302A, with automatic wipers, automated parking, and a 180-degree front camera. 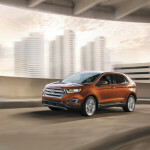 Finally Ford threw in the Drivers Package which had, in addition to variable-ratio steering and power-adjustable steering wheel, had forward collision warning and adaptive cruise control. There is also a Cold Weather package (useless here in Florida) available with a heated steering wheel, all-weather floor mats and a windshield wiper de-icer, and a tow package. 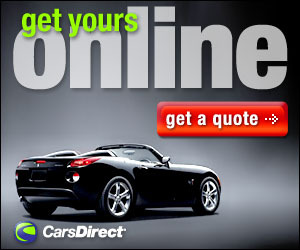 You can also have All-Wheel Drive as an option. 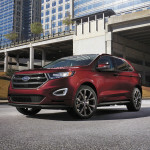 Under the hood the Edge has the 2.0 liter turbocharged 4-cylinder EcoBoost engine with 245 horsepower and 275 lb-ft of torque. You can option in a 3.5-liter V-6 with 280 horses and 255 lb-ft torque or a 2.7-liter twin-turbo V-6 which puts out 315 horsepower and 350 lb-ft torque. The only transmission available is a six-speed automatic. The only thing I didn’t like about the Edge was that I didn’t have it for longer. 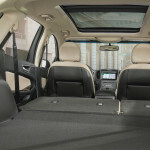 The inside is more than roomy enough for five adults without feeling too cramped, the interior makes a nice statement without being too loud or fluffy and as I found in the Escape everything is well laid out and easy to use. At first I was a bit disappointed that I had only the 2.0 under the hood; I am after all a gearhead at heart; the more power the better. But as the week went on I realized that the 2.0 is just fine. There is more than enough power for everyday use, and the only reason you might want to consider the V6 is for towing. After the week was over, I knew I had found an SUV I could live with. It looks great, has plenty of room and power; and seems able to handle just about anything you could throw at it. The only changes I would make would be to ditch the Cold weather package, because Florida, and swap the front wheel drive for AWD. Beyond that the Edge Titanium is pretty much perfect. At least in my world. I still want a car, but if they are eventually replaced by the SUV, you can bet there will be an Edge in my driveway.